After having helped hundreds of San Diego trustees, executors and administrators, experience shows our clients have similar concerns in hiring the right estate sale company. Most of our clients have become responsible for the San Diego estate of a loved one, and it’s the first time they’ve experienced being a San Diego trustee, executor or administrator. Prior to meeting with a San Diego estate sale company, don’t throw anything away. Many San Diego trustees, executors and administrators feel they need to clean up before they interview a San Diego estate sale company. The reality is that is the responsibility of the company, and a good San Diego estate sale company will manage tall of the decedent’s personal property. Items that the San Diego trustee, executor or administrator and the family members may value like crystal, china, and furniture tend to not bring in the dollars, it is the small collectibles and vintage items that a San Diego estate sale specialist will tell us really adds up. Where do you start? Spend your energy determining which items you would keep, and leave the rest to the San Diego estate sale company that you hire. After you and the family members remove your chosen items, begin the task of researching San Diego estate sale companies. You can ask your San Diego real estate agent, like me, for a referral. Then do a quick Google search and create your list. Focus on San Diego estate sale companies that have Internet exposure through their website. That way your sale will have exposure with photos of items for sale. You’ll want to choose a company that has great marketing and a list of people that visit their sales. Interview potential San Diego estate sale companies over the phone before narrowing down your list to two or three San Diego estate sale companies for an on-site consultation. It is best to have the consultation take place at the San Diego estate property so that the estate sale company can assess various aspects of the property. A few potential factors that will affect the San Diego estate sale beyond the property available are: parking, potential liabilities of the property, and thrift stores/donation sites/ and recycling centers located near the San Diego estate property. 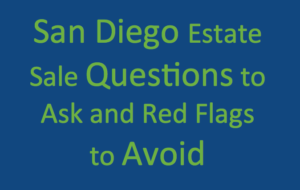 Don’t be afraid to ask many questions during the consultation with the San Diego estate sale company. Find out about their insurance coverage, how many staff members they have and if they contract out any of their services, and ask to review a copy of their contract. Note that if anything in the signed contract changes you have the right to a new contract or to walk away. Though it isn’t always available, it is a good idea to hire a San Diego estate sale company that acceptscredit cards. Accepting credit cards is an indicator that the company will conduct themselves professionally, and decreases the chance of errors throughout the process. Be sure that the San Diego estate sale company is not bringing in outside items to sell. This is a huge red flag that you’re dealing with an unprofessional estate sale company for many reasons including: Decreasing the total number of actual estate items sold (because buyers may choose items brought in instead); this will decrease the chances of emptying the property which is the goal of an estate sale; finally, the possibility that injury (someone trips on the power cord of a vintage lamp that was brought in) or property damage (scrape marks to flooring from furniture which was moved in) occur from items that didn’t belong to the estate in the first place! The San Diego estate sale company should lay out clear expectations for the value of the items to you, the San Diego trustee, executor or administrator. Often times the family will over estimate or under estimate the value of the estate, so ask the San Diego estate sale company to give you an accurate bid. Don’t hire a San Diego estate sale company that offers you “free cleanup” with no strings attached. This is often where the estate sale companies mentioned in #6 gather their outside items to sell from. This can mean that they are simply moving unsold items from one estate sale, to another and making a significantly higher profit by cutting out the middle man…the original owners of the items. Instead be sure that a buyout company or a charitable donation is listed in the contract as the final step for unsold items. Finding the right San Diego Estate sale company is how you pass your loved one’s treasures along to new owners in a respectful and well-organized way. Although this can be a daunting task for you, the San Diego trustee, executor or administrator, it is a necessary step to sell the San Diego estate real estate. By hiring a reputable San Diego estate sale company, the process can be handled with minimal stress to the family. It can be completed in a reasonable amount of time, save you, the San Diego trustee, executor or administrator time and emotional energy; all while making a profit for the estate (it sounds like a win to me!). If you’re interested in finding a reputable San Diego estate sale company call me, Kim Ward, for a five star referral at (619)741-0111.